One of the keys to personal development and success in business is reading, y’all. Big Red Car here on a early Tuesday morning (40F headed to 49F and cloudy) with a lot to do today, but I will find the time to read for an hour today without fail. Reading is the difference between being the King of the Jungle or a cub. Not bad to be a cub, but you, dear reader, want to be the King of the Jungle, don’t you? 1. Get up early and go to work. Work. 2. Stay late (sometimes, not all the time). Put in the hours. 4. Spend an hour reading and studying your profession or industry. <<< This is the one nobody ever does. Do you? Haha, no, you don’t, do you. Well, get on track! Read something which has an impact on your business or profession. Today, the Big Red Car is reading about crisis management as evidenced in the lives of military commanders in history. You will recall that the Big Red Car has a huge appreciation for George Washington as a crisis manager. Remember this? The Big Red Car is a huge fan of George Washington. You may want to read these posts also. Hey, go back and read that stuff. It can be your “reading” for today. Call to action, Big Red Car? 1. Take thirty minutes and make yourself a reading list. 3. Schedule an uninterrupted hour — no technology, no cell phone — and read. 5. Keep track of what you read and in six months you will be amazed — AMAZED — at how much you have done. But, hey, what the Hell do I really know anyway? I’m just a Big Red Car. Be good to yourself today and read. This entry was posted in CEO, CEO coaching, CEO skills and tagged reading. Bookmark the permalink. I was just looking at Bookship on Amazon and saw your video. Well played. I also saw you were a soldier once upon a time. Well played. Thank you! But I must correct you, my father, and my wife’s father, were career Army. I’m just an Army brat. 🙂 I think you saw my father’s decorations on my wall. Bronze Star with V device and purple heart amongst others. A constant reminder for me. The lion family looks nicely close! The father looks tired! The mother and cub look terrific. Far too few US human families look this close or even this good. 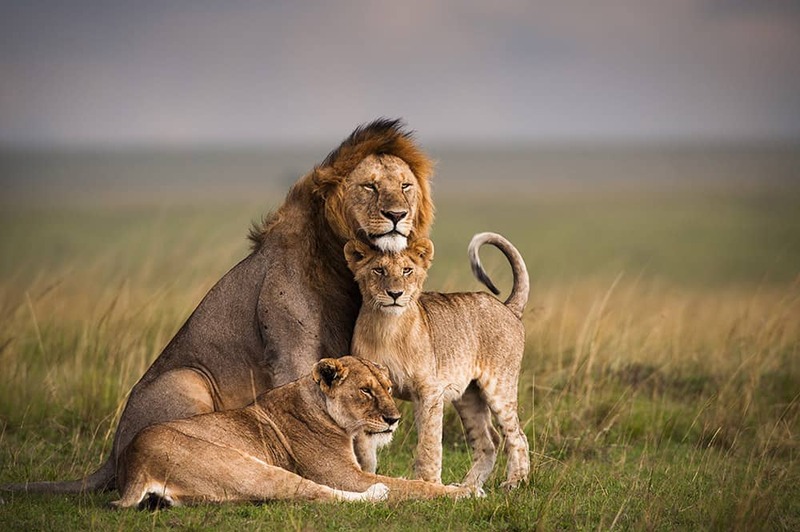 Lions know something too many US humans have forgotten: Close families are really important. CEOs need to read. What to read? Something which advances your career, your company, your profession. (1) New HP laptop came with Windows 10 installed but without DVDs to permit reinstalling Windows 10. But solving some problems, e.g., failure of the hard drive, can require reinstalling Windows 10. Just found on the laptop an HP PDF users guide that explains how to burn DVDs sufficient to reinstall Windows 10. (2) College course in electricity and magnetism made a mess out of the math of Maxwell’s equations. Well, now I know the math well enough so for fun occasionally review some of Maxswell’s equations. Still looking for an old reference: Supposedly only need the electric field since the magnetic field can be derived from the electric field and just special relativitiy. (3) Let R be the set of real number and n a positive integer. Consider the n-dimensional vector space R^n of n-tuples of real numbers. Assume also the usual inner (dot) product, distance, etc. For i = 1, 2, …, n, let X_i be a real valued random variable. Suppose the X_i are independent and have the same probability distribution. Let X be the corresponding random vector in R^n. Suppose S is a set of 1-1 functions s: R^n –> R^n so that the probability distributions of X and s(X) are the same. The leading way to get such an s is just to permute the components of X, that is, renumber the X_i, e.g., write them in reverse order. Let f: R^n –> R. So, for each s in S we can get f(s(X)), and the probability distribution is the same for each s in S. But, the set of all f(s(X)) for s in S need not be independent. Now, argue a little more and get a large collection, one for each such f and S, of statistical hypothesis tests that are both multi-dimensional and distribution free, apparently still the only such tests. With f and S carefully selected, some such tests should be about the best for detecting anomalies including zero day, i.e., never seen before, attacks on server farms and their networks. And there should be other applications to national security, industrial quality control, marketing, financial fraud detection, stock market investing, etc. This work also seems to provide a clean explanation for the collection of statistical tests known as resampling. The resampling part is essentially from the s in S. The leaders in such tests have long been Persi Diaconis and Bradley Efron. Efron was at Yale, and Diaconis, at Harvard; both have since been at Stanford. So, not exactly reading, but for relaxation before going to sleep, I work on polishing the above and looking for extensions. It’s just for relaxation: The math is too difficult for the world of practice. But this math stands totally to beat the pant off anything from current AI/ML for such problems and is yet another example of where some applied math makes nearly all of AI/ML look like silly, weak baby mumbling. (3) For the work, I do keep reading and collecting articles on publicity, marketing, user experiences, etc. Also new things are happening in Internet content, and I’m paying attention to those. (4) One of the new things in Internet content is now a lot of Hollywood movies from the late 1930s to about 1960 on YouTube. It can be fun to watch some of those movies and see some of how US culture in some ways has changed and in some ways has not. E.g., a lot of women had attitudes and lifestyles like feminists of today, and a lot of women, much more commonly than now, were eager to be good as wives and mothers. (5) Long my favorite piece of music is the Bach “Chaconne” he wrote for solo violin. Some well informed people regard it as the greatest piece of music ever written. When I was still working on making progress in violin, I made it through about 1/2 of it; it’s great fun to play, to scream out to the heavens the passion of the human spirit or some such! Well, the music is so highly regarded that there are versions for piano, organ, and full orchestra, and now YouTube has lots of performances, for each version usually more than one performance. Once start to understand the music, it’s fun to hear the different interpretations! Some of the crucial places where interpretations differ are (A) at the beginning, (B) near the end of the first D minor section, (C) as the end of the D major section. There are also discussion of the music easy to find via Google.